The Rev. 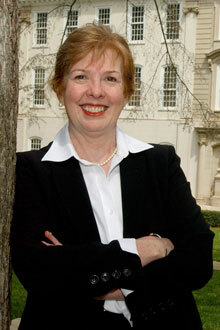 Susan Henry-Crowe, Emory University's dean of the chapel and religious life. Emory/Photo Video. Two special events, a farewell tribute and concert, will honor the Rev. Susan Henry-Crowe, Emory University's dean of the chapel and religious life, who has been appointed to an international leadership role in the United Methodist Church (UMC). The first event, a special Emory Community Salute to Henry-Crowe, will be Tuesday, Jan. 14 from 4 to 6 p.m. in the Cox Hall Ballroom. Those interested in attending are invited to register at emory.edu/events/salute. The second event will be a concert honoring Henry-Crowe on Sunday, Jan. 19, at 3 p.m. in the Cannon Chapel Sanctuary. The hour-long concert is free and open to the public, with free parking available at the Oxford Road and Fishburne decks. Following the concert, there will be a reception downstairs in Brooks Commons. Coordinated by University Organist Timothy Albrecht, the tribute concert will feature music of Bach and Rachmaninoff, among others, and the University Worship Chapel Choir, under the direction of Tamara Albrecht, musical history instructor at Emory and choir director and organist at Emmanuel Lutheran Church. Timothy Albrecht, a music professor in Emory College who also heads the University's graduate masters organ degree programs. Henry-Crowe has served as dean of the chapel and religious life at Emory since 1991, where her work focused on fostering interreligious dialogue in the ever-changing world of religious pluralism, including and coordinating the work of more than two dozen student religious groups of all the world's major faiths. While at Emory, she established the hallmark Journeys program, which has attracted more than 500 students, faculty and staff to participate in 34 programs in various countries and cultures to examine the root causes of conflict and injustice and search for reconciliation. She has also served as Candler School of Theology adjunct faculty member, where she received the school's Distinguished Alumni Award in 1995. An ordained United Methodist elder, she continues to serve as a member of the South Carolina Annual Conference of the church. In February, Henry-Crowe will leave the University to serve as general secretary of the General Board of Church and Society, the denomination's main arm for social justice and advocacy, education and international outreach.